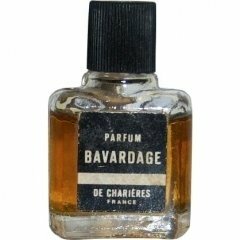 Bavardage is a perfume by Charrier / Parfums de Charières for women and was released in 1950. The production was apparently discontinued. Meaning idle banter, chit chat and/or gossip, Bavardage hits the spot for Old World Charm. Testing a mico mini vintage, from the 60´s perhaps. This is NICE perfume. I am surprized. I smell a mixture between Ma Griffe and Chanel No 5. It opens with a sparkling aldehyde splash. I cannot detect individual notes but it reminds me of other perfumes of the 50s and 60s. Not bad. Not bad at all. Write the first Review for Bavardage!